TwistedBrush Pro Studio saves your work automatically when you switch pages, change books, or close the program. Your work is also saved at timed intervals with a default of 5 minutes. Your work is saved to your hard drive into the default TwistedBrush installation folder. By default this is c:\Program Files\pixarra\twistedbrush. There, book folders are listed as Book1, Book2, etc where your page is saved into the book it is part of. 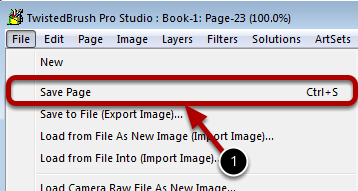 Files are saved in two formats; The TBR file format which the native format for TwistedBrush Pro Studio where all the layers information is saved and a BMP version of the page is also saved. In addition to the automatic save triggers you can at any time force the current page to be saved in your book using the Save Page menu. Additionally the Save Page option is available in the menu bar and Quick Command panel.